HIBS striker Paul Heffernan is planning a belated, but nevertheless welcome Christmas present for his manager Terry Butcher by declaring himself fit for the Boxing Day clash with Ross County. The Easter Road striker has been out of action since tearing a thigh muscle only six minutes into Butcher’s first match as manager of the apital club, but is now nearing the end of his rehabilitation and has his sights firmly fixed on playing his part over the hectic festive programme. Heffernan admitted the past few weeks have been frustrating on two fronts, missing his chance to make an immediate impression on Butcher and suffering as he has watched Hibs struggle in front of goal with just two scored in their last eight matches – a run which pre-dates the injury he picked up against St Mirren in Paisley – although one of those strikes did take Hibs into the fifth round of the Scottish Cup with their first ever win over Ross County. Even now he finds himself at a loss to explain how he ended up sidelined. He said: “I don’t know what happened. I just went to make a run into the corner and I felt as if I had been shot in the leg. “I came off straight away. I didn’t try to do anything that might have made it worse and it was diagnosed as a ‘grade one’ tear in my left thigh, which left me looking at four or five weeks out. Heffernan agreed the timing of his injury could not have been worse, as it coincided with Butcher’s arrival following the departure of his predecessor Pat Fenlon. 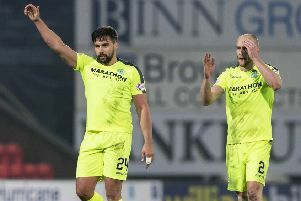 That left the 31-year-old in the strange situation of playing for a third manager this season, his association with Kilmarnock and their boss Allan Johnston having ended surprisingly and abruptly at the end of August, paving the way for his move to Easter Road. The much-travelled hitman said: “The new manager’s very first game and, like every player, you want to make an immediate impression. Unfortunately it was not to be. “Managerial changes happen in football, it’s a fact of life, but I have to admit I’ve never been in the situation of having three in the space of such a short time. “Having started the season with Killie, Pat Fenlon brought me here when I was told by them I was free to go only a couple of days after I’d actually played against Hibs at Rugby Park. “Then, a few weeks later, he’d gone and Terry Butcher’s come in. It’s definitely not something that happens to you all the time, but it’s one of those things that’s out of your control. Heffernan’s opportunities to impress Butcher in a green-and-white shirt may have been severely restricted so far, but if the big Englishman requires any proof as to his potency in front of goal, he need only look back to last season when Inverness Caledonian Thistle were bounced out of the Scottish Cup thanks to his two goals for Kilmarnock. However, before Hibs face Raith Rovers in the fifth round of that particular competition, they face – as do all Scottish Premiership sides – a tough couple of weeks with games coming thick and fast over the holiday period, starting with the visit of St Johnstone on Saturday. Heffernan has fond memories of his last match against the Saints, scoring on his first start for Hibs, while James Collins also claimed his first goal in netting the winner before the pair combined with another two the following week to take care of St Mirren. But while this weekend’s match will come too quickly for Heffernan, he is determined to be in the thick of the action as quickly as possible and, in particular, the derby with Hearts on January 2. He missed the League Cup confrontation between the Capital’s big two – which proved to be Fenlon’s last game – having been cup-tied thanks to a substitute appearance for Killie as they were knocked out by Hamilton in the previous round. He said: “It’s the busiest time of the year for a football player, with so many games in such a short period of time. It’s a fair whack of the season in only a couple of weeks or so and you don’t want to be injured over that period. “I want to play my part. I was really disappointed to miss the last derby and I’d love to play in the next one. Heffernan hopes he can bring some added firepower to Butcher’s side, although he believes the chances are being created and it’s only a matter of time before the drought turns into something like a flood. He said: “Obviously we haven’t been scoring as many goals as we would want and if you aren’t doing that you cannot win games. “But everyone is working hard to try to get it right and I’m sure once we get a couple of goals in a game the confidence will come back. However, as long as we are creating chances as a team, we have players who will score goals. I said after a week’s training at East Mains we had strikers who can score goals and I remain of that opinion. “We’ve got a lot of quality. James, Danny Handling, Ross Caldwell and myself … we all bring something different to the table. And in the time I’ve been out, young Jason Cummings has started to make the breakthrough. He’s a natural finisher, as you can see with 30 goals now for the Under-20s and the East of Scotland team. I’ve seen him in training and he can certainly finish. He’s progressing well and I’m sure that with more game time, more experience he’ll have a great career with Hibs.